In the first ten weeks of this year, I have worked hard to acquire new clients, successfully complete work for clients, write here, work towards greater visibility and membership for Studio30 Plus, and have taught a lot of classes. In that same period of time, Sean temporarily moved in with us, and we have focused on successfully blending our family of five kids. And I have been training for a half marathon. It has been a lot in a short period of time. Through it all, I have been focused on trying to keep a balance with work, family, and life. Until recently, I have felt successful. Discovering proper balance again came in the form of a pediatrician’s appointment. Yesterday I was not able to work a full day because Monkey had a doctor’s appointment. It resulted in a nice lunch out with him, having his company as we ran a few errands, and attending his appointment. What I realized was I needed more time with the kids–I have missed them these last few days I have maintained an intense work schedule. As a result, we had a family movie night last night. And today I am running regardless of my “to do” list. This is what I needed this week to feel a bit more in balance again. It’s difficult as a working parent to find balance. I struggle with it each week, feeling I didn’t give enough on the work side or on the family side; there’s always guilt and a tug in one direction or the other. What I am learning, though, is to be aware and adjust in the moment, if possible. If there’s a big deadline looming, schedule the family (or running) time as soon as possible. Staying ever mindful seems to be the key. How do you juggle all of your life responsibilities? So timely to stumble across your blog as I have been struggling with the work/life balance a lot lately. I work 40 hours a week, but with the nature of my work I feel so exhausted when I come home that it bleeds into my personal life. I am lucky to have a husband who has a flexible job, but that means he takes care of more home and child stuff… And that leads to guilt on my part. One thing we added was to work out. It takes away from my kid time, but I realized I needed time where I was doing something important for me. And everyone benefits for that. In the end there are things that get neglected at home, but I have to work so it is what it is. I am glad you discovered this post at the perfect time to help. It is such a struggle, and adding a mom factor in makes it that much more challenging. Just be kind to yourself when you don’t achieve the perfect balance–that’s what I am trying to do at least. With deep and abiding gratitude for my husband, who is doing the same balancing act. It helps that I work from home and he teaches nights, but we still have to constantly be on guard to not lose our time together to some other activity. I think there needs to be a constant vigilance because with kids, work, and all the life responsibilities, it’s easy for the relationship to slip. I am doing my best, too. This is hard for me too… even though I am staying at home, when I’m at home I want to write so much and keep up with all of the social media that comes with trying to promote the page, etc. I often feel guilty about taking away time from my little ones, and feel like I have NO balance. Then, I was at a conference last weekend, and one of the presenters said the most amazing thing. And it really resonated. 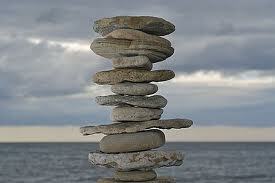 She said that you will never achieve a perfect balance, but you CAN be PRESENT in what ever you are doing. When you are being a mom, be PRESENT as a mom. Turn off the computer, phone, whatever and just be mom. When you are working, work. Try to establish schedules and boundaries and keep within them. I thought that was great advice. Now I’m just trying to figure out how to schedule my life to make that work! This is such a great concept to share. Thank you! I love the thought of being present in what you are doing. Having that as the goal means a more focused effort and greater results at whatever you are doing. I am going to try to focus on this idea instead of always worrying I am not doing enough or that something else needs my attention.